Well things are, as you might expect, moving on apace. Though now that the walls are up there is this rather misleading impression that it is close to completion and there is little movement as builders and electricians are obscured by the walls as they work away at their allotted tasks. I have to say that the excitement rose a little today as all the plumbing and porcelain arrived for the sinks and disabled toilet. All these little steps in the build make me feel that there is light at the end of the tunnel (no pun intended). Each of the rooms is beginning to take shape and I can imagine their layout with desk, or audiology booth, or easy chairs. Our conference/meeting/training room will be a good sized space and I am starting to think about how I can promote it to potential users. 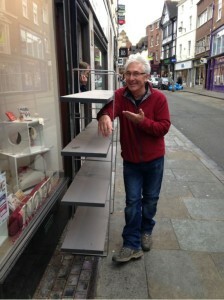 Neil Davda, our Grants Fundraiser, helped me carry these ‘recycled’ shelves I managed to get donated, down the High Street to the Hub. There is a lot of crashing and bagging going on around me today at the Hub as the plumbing is being worked out and I am upstairs finishing off the shelves ready to receive stock and other goodies. 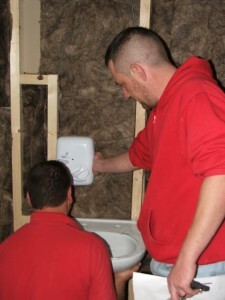 Whilst I work away I am trying to think of the layout and decorating of the reception area, rooms and café. With our link with international projects in Africa I am hoping we can have some colourful fabrics to brighten the space and some large plants to break up the space. Both of these elements will make the Hub a venue people will want to be in, but will also help in absorbing noise and soften the space. I am starting to fill our storeroom upstairs at the HUB with items that I have managed to get donated or purchased that we will need when the shop-fit has been completed. The shelves are coming in very useful. Today I received a delivery of furniture, some stackable butterfly chairs for the meeting room and armchairs for the treatment rooms. 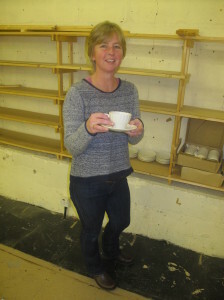 Heather from The Links Café was also there to receive some comfy chairs and few tables for the café and also brought in some crockery (which is sitting inanticipation of lashings of cake and pots of steaming tea, I think Heather is wishing it was a full cup she is holding!). All of these elements really do make the whole process start to feel real. Now, where is the rest of my list of things I need to arrange, source, buy, collect, build, or just tick off as completed. What a great feeling when I can sign off on one more item on my ‘opus magna’. This entry was posted in Blog on October 28, 2014 by penval.